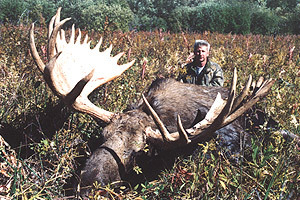 This hunt is conducted during the moose rut from September 10 to October 10th. The area is situated on the Tolbachik River around 400klm north of the capital Petropavlovsk- Kamchatsky. At this time of the year moose are susceptible to calling and it’s a real adrenalin rush watching a huge bull lumbering towards the call! Day 1: Arrive in the capital Petropavlovsk- Kamchatsky. Meet and greet by outfitter then transfer to the village of Atlasovo for transport into camp by ATV. Accommodation is supplied in cabins with a typical Russian sauna/bathroom. A full time cook is on hand to prepare traditional Russian food and snacks. Day 2 – Day 8: Hunting for moose by stalking and calling along the Tolbachik, Levaya and Pravaya Rivers. 7 full hunting days or until a trophy moose is taken. Day 9: Depart camp and return to Petropavlovsk- Kamchatsky, overnight in hotel. Prepare export documents and packing of trophy. Day 10: Transfer to airport for flight home.